I have just finished reading Stephen King’s End of Watch, the final book in the Bill Hodges trilogy, and I highly recommend it. If you enjoy well-written thrillers with quirky characters, you’ll enjoy this, even more so if you like those characters to be full of flaws and a long way from action movie stars. The trilogy follows retired detective K. William “Bill” Hodges, who gains new friends and a new lease on life when he takes on trying to solve his last unresolved case. That turns into a new business, new discoveries, and, ultimately, confronting some difficult questions. I’m not much for writing reviews - to be honest, I’m not much for reading reviews - but it’s a great ride that is quite worthy of King, though almost nothing like most of what people expect from him. Those who know me know that I am an avid Stephen King fan. I’ve read everything he has written, much of it multiple times. I’ve come to a conclusion over the years that I’m not even certain King, himself, is consciously aware of. While he is, of course, famous as the Master of Horror, Stephen King has written successfully in nearly every major genre there is. If you actually take a closer look at his body of work, you’ll find that he is almost more of a dramatist than a horror writer, and most of his work is compelling (and, as a result, successful) because of his fascination with and pretty solid understanding of human nature and the whole human condition. Almost every generation for the past thirty of forty years has had at least one groundbreaking drama or coming of age movie that was based on a Stephen King story. It’s true that he works fantastically well with the weird and the macabre, but there is another thread that runs through almost everything he has written (especially in the latter half of his career) that doesn’t get nearly as much attention: Hope. Sometimes they win. 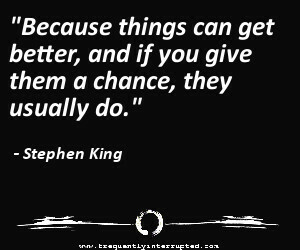 That’s true, and it would be foolish in the extreme to ignore that, to pretend it wasn’t a factor, but Stephen King has spent a career demonstrating that we can win too. It doesn’t have to be easy to be possible, and it doesn’t have to be a guaranteed victory to be worth trying. Sometimes they win, but sometimes we win. Keep trying because it can get better. The story isn’t over until it’s over and, even then, sometimes the end is still not the end. Hope can be found in the most unlikely places, if we only look.